Facilitates a scalable, low-cost, access-settlement-free peering architecture for bill and keep operators. Provides a low-cost terminations option for CABS-based operators, while providing a new SIP platform for access revenue growth. 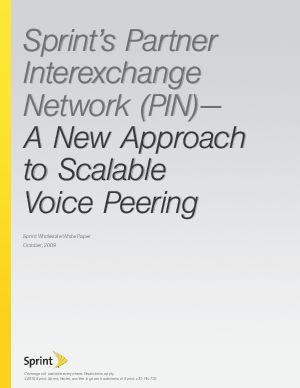 Provides competitive Long Distance PSTN termination through Sprint's VAST feature group D interconnections. Provides the foundation for the growth and exchange of new SIP-based applications outside of voice service-such as video calling and conferencing, peer-to-peer applications, HD Voice, UC applications (presence) and more. The Sprint choice is simple - we have demonstrated VoIP leadership and have a long, successful track record of offering global wireline and wireless IP and voice services. We're not focused on selling you a one-size-fits-all solution or a standard contract. Instead we want to provide you with customized solutions and the right mix of resources to help you improve your business performance - Now.